Line follower Robot is a machine which follows a line, either a black line or white line. Basically there are two types of line follower robots: one is black line follower which follows black line and second is white line follower which follows white line. Line follower actually senses the line and run over it. Arduino Pro Mini is used for controlling whole the process of line follower robot. The outputs of comparators are connected to digital pin number 2 and 3 of arduino. Arduino read these signals and send commands to driver circuit to drive line follower. Driver section consists motor driver and two DC motors. Motor driver is used for driving motors because arduino does not supply enough voltage and current to motor. So we add a motor driver circuit to get enough voltage and current for motor. Arduino sends commands to this motor driver and then it drive motors. Working of line follower is very interesting. 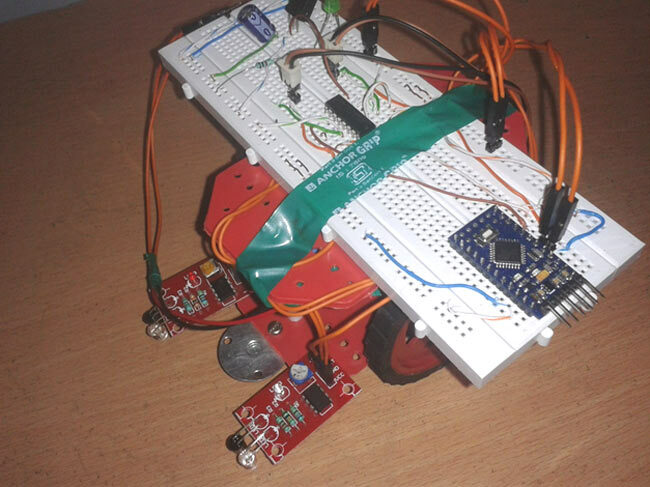 Line follower robot senses black line by using sensor and then sends the signal to arduino. Then arduino drives the motor according to sensors' output. Complete circuit diagram for arduino line follower robot is shown in the above iamge. As you can see output of comparators is directly connected to arduino digital pin number 2 and 3. And motor driver’s input pin 2, 7, 10 and 15 is connected to arduino's digital pin number 4, 5, 6 and 7 respectively. And one motor is connected at output pin of motor driver 3 and 6 and another motor is connected at pin 11 and 14. In program, first of all we defined input and output pin, and then in loop we checks inputs and sends output according to inputs to output pin for driving motor. For checking input pin we used “if” statements. There are four conditions in this line following robot that we read by using arduino. We have used two sensor namely left sensor and right sensor. We write the arduino line follower code according to the conditions shown in table above. In our Project we have used a microcontroller to control whole the process of system that is ARDUINO. Arduino is an open source hardware and very useful for project developments. There are many types of arduino like Arduino UNO, arduino mega, arduino pro mini, Lilypad etc. available in the market. Here we have used arduino pro mini in this project as arduino pro mini is small and so breadboard compatible. To burn program we have used FTDI burner. L293D is a motor driver IC which has two channels for driving two motors. L293D has two inbuilt Transistor Darlington pair for current amplification and a separate power supply pin for giving external supply to motors. IR Module is sensor circuit which consists IR LED/photodiode pair, potentiometer, LM358, resistors and LED. IR sensor transmits Infrared light and photo diode receives the infrared light. I have added a voltage regulator to get 5 volt for arduino, comparator and motor driver. And a 9 volt battery is used to power the circuit. Will there be no headder file included in program ? if yes, can u give the complete program.And which software u used to burn program on arduino uno. How many pins does your sensor have? If 3: you can see they will be marked as follows: VCC, GND and the third pin isOutput. Connect VCC to 5V and GND to Ground and then connect the Output pin to the Analog/Digital pin of Arduino..any way u like it. If you are following this particular code then connect the output of LEFT SENSOR to digital pin 2 of your Arduino and the output of RIGHT SENSOR to digital pin 3 of the Arduino. Hope this helps!! Hello, I m not so families with these things. But I wanted to know.. If I have IR module.. Then do I need to put all the resistance, LM358,diode etc as instructed on circuit. I am using arduino uno, will the same code work and my robot only has 2 motors for the Weels and 2 IR sensors ( 2 receivers and 2 emitters). Check if you declared the LS properly in the code. how can i slow the speed of my motor ? i already test it but i want to slow the speed of my motor what will i do to slow down the speed ? You can reduce the driving Voltage by using some voltage regulator like LM317. can you please tell me this program is correct or not. But after the finishing of the line (black or white) robot can stop for this program.robot can turn the 180 angle so which type of the else are put in the program. maybe you could add a third sensor in the middle ad add an IF statement that cheks the if the two sides sensors are sensing something and the middel sensor is sensing something else then do something (which is using the proper code for that line that is sensed by the middel sensor) that code be done by putting the two codes in external functions and calling them when needed . Can i know how do you connect the battery ? which component that you connect it with ? i try to understand, but i cant find the answer. Use a simple 9v Battery, and connect is according to Circuit Diagram. Sir , could you list all the components needed for this project ? thank you . If you'll be using arduino, what changes to the ckt will be made? How to turn the line follower at exact 90 degree. it would be better if the reply is given the the exact code. thanks. It follows Black line, whatever is the path, even 90 degree. 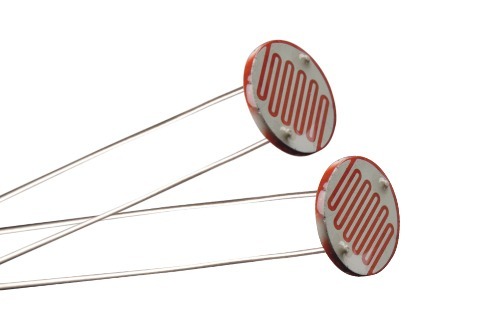 We have used 2 IR sensors or IR modules which mainly consists one IR LED and one Photo diode (Black LED type component). They are available online as well as offline on stores. "Arduino: 1.8.0 (Windows 10), Board: "Arduino/Genuino Uno"
Sketch uses 1178 bytes (3%) of program storage space. Maximum is 32256 bytes. I have had this problem previously. To fix it I changed the COM port. You can do this by going to tools > port > then select the final port listed. Do you have a schematic diagram of the connection between the components? i have 4 way infrared tracking sensor could you please tell me how i connect this to arduino uno r3 and also tell me the code of this type infrared sensor. can u say the program for which i can use 2 ir sensor for following black line and two ir sensor following white surface in single program plz. if it reads LS means left sensor has an output of 1,hence it is on white.RS doesnt reads means it has value of 0 and its on black line.so its should movie to right side.but program here shows to turn left.plz clear my doubt as iam a beginner. You are right.. it will turn rights as right sensor reads 0 because its black surface so it will turn right. code is correct inside as Left motor is moving, right motor is stopped so it will turn right. can i use arduino nano instead of mini ore can i use arduino uno intead of it..
Hv u used 4 motors????? I guess this would work as well? how to write a arduino code using analog for line follower robot. Hi...can anyone pls tell me how this comparator works... What will be the output of comparator in black surface and white surface?? What is a waiter robot? hello sir. I like to know whether can I use your code for arduino leonardo or shall I make some change? my sensor 8 sensors line follower. hi i want to make pid lineflower robot but do not know can u help me for that? in this code why none of the left motor 2 or righ motor 2 moves?? I cannot understand your question. You should see both the motors moving at some point of time. Check the video!! How do I make my robot move halfway and turn ? Sir, How can i increase the speed of the robot so it can run fast? can u please give me the coading of IR8 sensor ? Anyone got a fritzing of this circuit, or one similar? I need code for robot check line 5 sensors. It is very difficult with me.! who can help me here? please send me a code, i am thank you very much! I am using the 2 iut ir sensor but unable to turn my bot 90 degree what to do and how can i turn it 90 degree. I don't understand where you used 4 motors. If you did... I can only see 2 motors. Is the code actually wrong? There are only two motors, the code is also written only for two motors. Where did you assume that the author has used 4 motors. Can this be done with light sensors? And how would the code change?